Noted.Probably it hits his liver.All who met him and work will gladly pray for him.Deserves credit for being good.Some CC doesnt due to bad things done. Can hit all male species .From vip to man in the street.Difference is he is being remember.He done it Alfonsius Way.Drink to that. A brave man who spoke his mind. Hope his pain reduces and he finds peace. A rebel at work and a pain for the coy. Was forced to retire early. Yup.So many finds his good point when he served.Will be remembering his strength and not plp to be AM or whatever.Stay as long as you can so that live eulogise and accorlades to grace his moments.A rebel with a cause and truly a giant among CC.Please God let him savior his finest hours as express here.Sadly current Am and Sexi doing the sh## work.Beware. 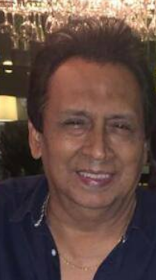 Pardon me, is this Aloysius De Souza? Is he the one the old buggers refer to as speedy gonzales? 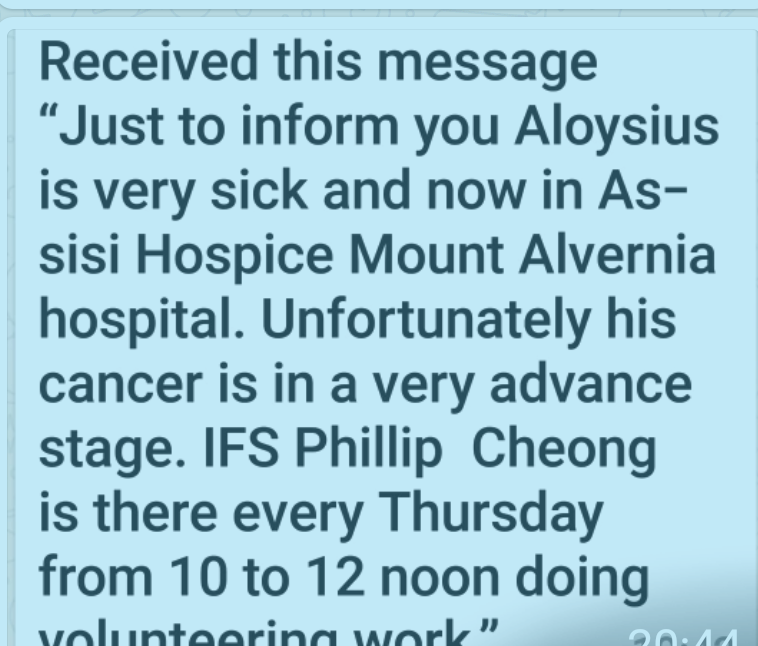 Alfonsius is as remotely different as Aloysius.Most De Souza are rotting like Email.Similarly Alqueda from All queu here the line starts here.The only Speedy is Shorty Chiong,and its not a song and hardly Mexican.You heard the wrong side of him,he is a Giant among CC,got his own class with a Bordeas in his hand,fine chisel front and astounding good looker.He will draw his final curtain on his own terms which living Eulogise which will please him.One had to have proven record in CC and not Gayee to be notice.Try harder,you might be awed and lets us sing your song.Alfonsius is his own Hymns and still a Giant compared to others who goes by stab in the back and fixing juniors,then promoted.Lets us peruse your lifework in CC and done.By the way buggers refers to the fingers pointed which always point at oneself. 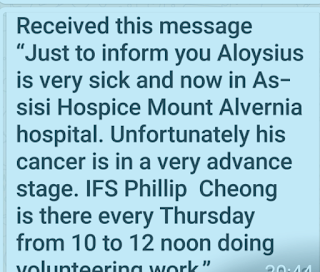 all these Gayees & Lassies got to do with aloysius who is dying? Moron!!! James Dean never grow old,his memory lives forever.Rebel without a cause,parallel that of Alfonsius time in CC.On his own term without hypocrisy and ponposity throughout.Regrets to point that Section 377 till not repeal,so will not delve into it.One success in live consist of family orientated activities and absolutely got nothing for or against them.By the way Aloysius will be happy so rememberance of his acts made his memories so vivid and iconic.Being remembered in one lifetime is many times better than after passing.I will still drink to his name,now and later.Any objection ?However if you deserves accorlades,post it here.Otherwise do the write thing. He's dying of cancer or AIDS? He is not dying ,only choosing when to draw the final curtain,based on living eulogy on his time as CC.Done it his way,and getting on to milky way and beyond.He could not leave early due to praises and good comments and thoughtfull words.Great guy all in all not wimpy nor anything like.When one had the Bordeous on the hand ,remember him with the rich bouquet aromas,he been there and now going to beyond.Salut and drink to a great guy,a loss to CC. In the stars above the milky way. Alfonsius had done it his way. Down the curtain now finish the wine. As the band plays Papa was a Rolling Stone.Wait Michael for him.One LMC on the way.Godspeed.